The service contract approach defines the contract that specify how providers and consumers work together to achieve a goal, through the use of service. The service contract represents an agreement between parties for how the service is to be provided and consumed. Such agreement includes the interfaces, choreography and other terms and conditions. 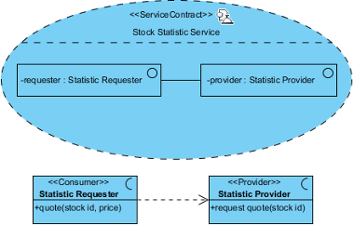 Service contract diagram is designed for the specification of service contract. Modelers usually combines the use of sequence diagram and activity diagram in representing the choreography of a service contract. In the New Diagram window, select Service Contract Diagram. Service Contract A ServiceContract is the specification of the agreement between providers and consumers of a service as to know what information, products, assets, value, and obligations will flow between the providers and consumers of that service. It specifies the service without regard for realization, capabilities, or implementation. A ServiceContract does not require the specification of who, how, or why any party will fulfill their obligations under that ServiceContract, thus providing for the loose coupling of the SOA paradigm. In most cases, a ServiceContract will specify two roles (provider and consumer) but other service roles may be specified as well. The ServiceContract may also own a behavior that specifies the sequencing of the exchanges between the parties as well as the resulting state and delivery of the capability. The owned behavior is the choreography of the service and may use any of the standard UML behaviors such as an interaction, timing, state, or activity diagram. providers must interact. The roles in a ServiceContract are typed by Interfaces that specify Operations and events which comprise the choreographed interactions of the services. Provider A “Provider” models the interface provided by the provider of a service. The provider of the service delivers the results of the service interaction. The provider will normally be the one that responds to the service interaction. Provider interfaces are used as the type of a “ServiceContract” and are bound by the terms and conditions of that service contract. Consumer A «Consumer» models the interface provided by the consumer of a service. The consumer of the service receives the results of the service interaction. The consumer will normally be the one that initiates the service interaction. Consumer interfaces are used as the type of a «ServiceContract» and are bound by the terms and conditions of that service contract. Connector Connect roles, if any, in a participant.